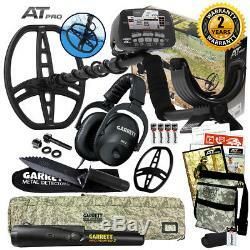 Garrett AT Pro Underwater Waterproof Metal Detector, Pro Pointer II, Accessories. Carry Bags, Pouches & Covers. The AT Pro detector features Pro Mode Audio, High-Res Iron Discrimination, Digital Target ID, Fast Recovery Speed, Ground Balance, Graphic Target Analyzer, Continuous Coin Depth Indicator, Depth Indicator and Search Modes. This metal detector is ideal for Coin Hunting, Jewelry Hunting, Relic Hunting, Competition Events, Cache Hunting, Prospecting and even Dry Beach/Fresh Water Hunting. Highly Recommended for - Coin Hunting, Jewelry Hunting, Relic Hunting, Cache Hunting, Prospecting, Ghost Town Hunting, Competition Events, Beach/Fresh Water Hunting. WATERPROOF TO 10 FEET OR 3 METERS. AT Pro is Garretts all-new, all-terrain, all-treasure, deep-seeking, professional treasure hunters detector! This all-terrain detector offers new and exclusive Garrett technology that makes it ideal for hunting coins, relics, caches, jewelry, and even gold nuggets. Select from either Standard or Professional search modes with enhanced audio features. The AT Pro is engineered with a waterproof housing and connectors to protect in dusty, muddy, wet and humid environments. The AT Pro can be immersed in water to a 10-foot depth (maximum) to search in and along shorelines, rivers, piers, docks or swimming holes, as well as all land sites from mountains to dry deserts. AT (All-Terrain) can be used anywhere on land or in water. Garrett AT PRO Instruction Manual - Instruction Manual to help assemble, take care of and learn how to operate your metal detector. Garrett 8.5" x 11" PROformance DD submersible search coil - DD configuration provides greater detection depth and performance by significantly reducing the negative effects of heavily mineralized ground and saltwater interference. Garrett Master Sound 2 Headphones - Built, field tested and approved for land use. Garrett Camo Finds Pouch - Separate pockets for your finds and trash. Garrett 8.5" x 11" Coil Cover - Protect your search coil from scratches and scuffs due to rough terrain and conditions. Garrett Edge Digger - Strong carbon steel blade with cutting edge teeth. Non-slip blade guard with comfortable rubber handle. Includes Garrett carry sheath for belt mount use. Garrett Digital Camouflage Soft Case - Padded travel/storage bag, 46 length with full zipper opening, carrying handle and backpack straps. Garrett Pro-Pointer II - The Pro-Pointer II combines performance with sleek design to assist in pinpointing those hard-to-find targets. Garrett Search Coil Hardware Kit - This kit includes the nut, bolt and washers that hold the search coil to the lower pole of your Garrett Metal Detector. Garrett AT Pro Instructional DVD. 4 "AA" Batteries Included - Go Metal Detecting the moment you receive your Metal Detector. Pro Mode Audio: Proportional Audio and Tone Roll Audio features allow the user to hear characteristics of a target as they would in a True All-Metal Mode. High-Res Iron Discrimination: Use touch pads to set iron discrimination in one of 40 levels for precise ability to separate good targets from trash. Digital Target ID: 0 to 99 Target ID scale offers increased ability to distinguish one target's conductivity from another. Iron Audio: Allows the user to hear discriminated iron and to alter the detector's mid-tone signal's range. Fast Recovery Speed: Allows greater ability to pick out good targets amongst trash. All Terrain Versatility: Weatherproof housing designed for dusty, humid or wet environments; unit can be submerged to a maximum 10-foot depth. 15 kHz frequency: improved detection of small targets, gold nuggets, jewelry. Ground Balance: automatic and manually adjustable for improved performance. Graphic Target Analyzer (GTA): identifies target's conductivity. Continuous Coin Depth Indicator: to determine target depth. Battery Condition Indicator: shows battery life continually. Depth Indicator: Continually shows depth of coin-size objects. Battery Condition Indicator: Shows batter life continually. Search Modes (Discrimination Patterns): 6 plus electronic pinpointing. Target ID Cursor Segments: 12 (notchable). Search Modes: 6 (3 Standard, 3 Pro modes). Audio Tone ID Levels: 3. Standard Search Coil: 8.5" x 11" DD PROformance. Length (Adjustable): 42" to 51" (1.06m - 1.29m). Total Weight: 3.03 lbs. Listings for USED Items / Auctions. You have nothing to lose! 3901 Bestech Road #100 Ypsilanti, MI 48197. Opening hours: Monday through Friday 8:30AM 5:00PM. Our reason for being is to help You find the Best Metal Detectors and Accessories that fit Your specific needs. It's simple, we say NO to junk and make your Metal Detecting Experience GREAT. With Serious Detecting you know you will get high quality products and service without compromises. The item "Garrett AT Pro Underwater Waterproof Metal Detector, Pro Pointer II, Accessories" is in sale since Thursday, July 18, 2013. This item is in the category "Business & Industrial\Test, Measurement & Inspection\Test Meters & Detectors\Metal Detectors". The seller is "serious_detecting" and is located in Ypsilanti, Michigan. This item can be shipped to United States.